I'm in need of a little help in regards to researching a badge in a photo of my great-grandfather that I'm colourising which I hope to have done by November 11. Below is a crop of the photo with the badge circled. Unfortunately I don't know what his exact role/duties were with the N.Z.M.R. but I do know he was an instructor from 1914 till late 1916 when he shipped out to Egypt with the 19th Reinforcements and the rank of sergeant. It'd be great to know what it was for but I fully realise that as it is blurred they may well prove to be impossible, but even a guess is better than nothing! For the moment I'm assuming that it would have been brass like the rest of the tunic buttons. To me that looks like a brass button. Just a guess here but was that perhaps an extra button to which a leather or webbing bandoleer with ammunition pouches might have been secured so it didn't slip while riding? To my eye, the "badge" does NOT look brass (officially buttons were "gilt metal"), and if it is a button, it is certainly a badly broken one. Really one for the specialists, but it is interesting that it is worn on the wearer's right (viewer's left) which may well have meaning, as during WW2 (and today?) this indicated that badges worn in that position were not to be worn in company with official badges or insignia (such as decorations or campaign medals) but were nevertheless still permitted to be worn on the uniform, so perhaps could be described as semi-official, or perhaps only permitted on special prescribed occasions. 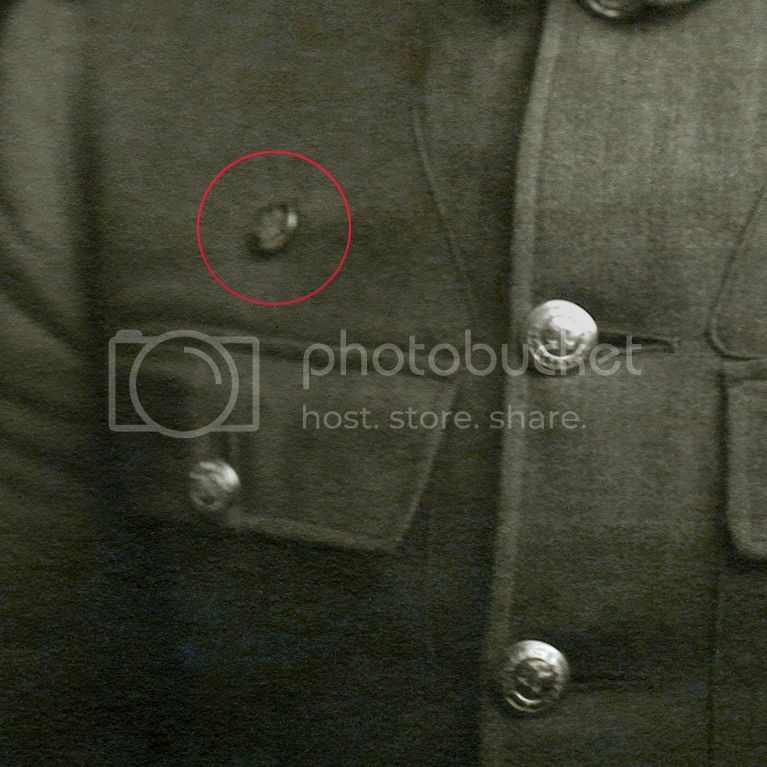 The shape of this badge (in photo) is certainly not symmetrical, so where are our WW1 Army uniform experts? 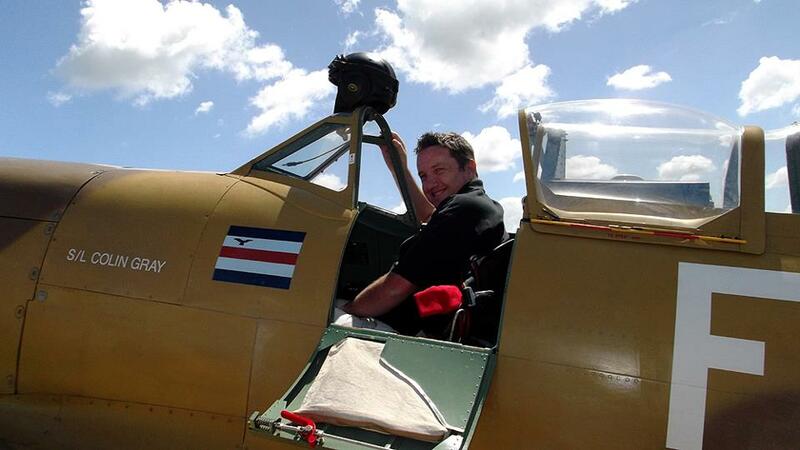 Then again, maybe Dave H is right in suggesting that it is for the support of some sort of military equipment, and might even be a broken button! I thought rather than broken it may just be tilted backwards so we're viewing it from partially side on? The other buttons are under tension but is this is a button it would have had slack to allow something to be buttoned to it. Thanks for your replies and your thoughts, certainly food for thought. Since posting this thread I've had what may be a break through. Last night my attention was directed to a thread on NZMR badges (link below) which in itself didn't give me any clues until this morning when, while talking with my mum, I found out the Fred had been a member of the Legion of Frontiersmen and after reading a few more threads (also linked below) I now have a strong suspicion that it's his Frontiersmen badge we're looking at. I should also point out that I have another photo of Fred showing both the badge (again the details aren't visible but it is definitely not 'broken' but as Dave suggested just sitting oddly in the above photo) and also the later pattern 1903 bandolier which I suspect mat have caused the badge being moved from the left breast to the right due to the bandolier looping lower across the chest. I actually had wondered if it might be a Legion of Frontiersmen badge when I first looked at it, as I know they had a close affiliation with the Army back then and were allowed to wear LofF regalia on their uniforms sometimes, but I did a search and turned up nothing like it. But yes, maybe it is the case. I did a search regarding wearing of LOF badges and it was not permitted officially to wear their badge on uniforms and there were several letters written regarding this. The only non army badge permitted was the RSA badge and that only on "walking out"uniform. As an aside, I found another photo of Fred's showing some more N.Z.M.R members in Egypt and one of them, a Sergeant McCulloch, also appears to be wearing the same type of badge/button. Out of curiosity, would anyone know what S.A.I could stand for? I ask as I found a strange little pin of sorts amongst Fred's stuff which has the number XI (presumably for the XI North Auckland squadron) and those letters. Here's the finished article by the way. I scanned and coloured the photo in a larger format than this, which is a small version I uploaded to facebook.